If you’re not already consuming bone broth, now is the perfect time to start! Although not new (it was a staple in preindustrial societies and likely the “secret” ingredient in grandma’s chicken soup), bone broth is an inexpensive, nutrient-dense food with myriad health benefits. Whether you’re looking to achieve improved skin tone, strong nails and hair, healthy joints, or optimized metabolism, or to help heal autoimmunity, leaky gut (increased intestinal permeability), arthritis, gastrointestinal disturbances, or colds, bone broth can help. Bone broth is full of nutrients that work to heal intestinal cells for optimized immunity and digestion, decreasing inflammation and oxidative stress. Collagen, important for bone and skin health, is found in bones and other connective tissues. During the cooking process, collagen is extracted from the bones and transformed into gelatin. Gelatin is what allows bone broth to congeal when cooled, becoming gelatinous and jiggly. The more connective tissue between the bones (accomplished by including chicken feet, knuckle bones, and tendons . . . more about this below) you use, the more your broth will gelatinize. As for the health benefits of gelatin, it facilitates healing the intestinal tract lining by supporting gut mucosa (slickety slick is the trick! ), decreases inflammation, and strengthens hair, nails, and skin. Just look at any joint supplement and you’ll likely encounter glycosaminoglycans—glucosamine, chondroitin, and hyaluronic acid. When making bone broth, glycosaminoglycans are released from bones and joints. These joint-supportive nutrients also have anti-inflammatory and anti-oxidant effects, and come packaged with the other health-promoting components in bone broth discussed here. 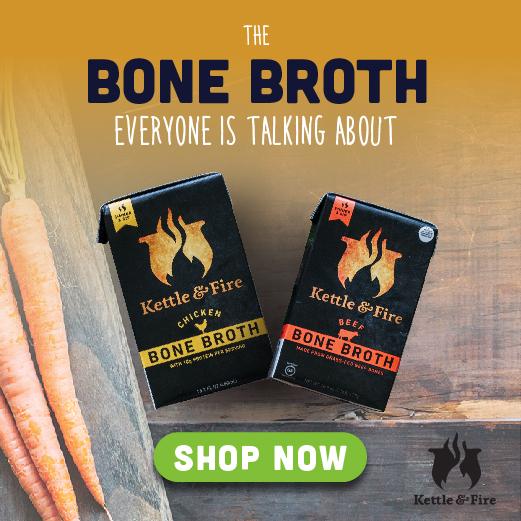 Although the exact amounts of nutrients in each batch of bone broth will vary and nutritional analyses are unsubstantial to date, bones are mineral-rich, releasing trace minerals, phosphorus, magnesium, potassium, silica, to name a few, during cooking. These minerals support bone health and provide electrolytes important for cell functioning and hydration. Bone broth is a rich source of easy to assimilate amino acids—building blocks of protein—that are used to support various systems of the body. Glutamine is an amino acid that fuels intestinal cells and improves immune function, thereby playing an integral role in healing leaky gut and maintaining the intestinal lining so that your body can absorb nutrients from food, minimize autoimmunity, and guard against harmful pathogens. Proline and arginine are other anti-inflammatory amino acids, which contribute to decreasing inflammation throughout the body, healing leaky gut, and building connective tissue. Wonder why grandma’s chicken soup alleviates congestion during a cold? Cysteine is an amino acid that breaks down mucus secretions. Moreover, it is used to make glutathione—a powerful anti-oxidant for neutralizing oxidative stress and detoxifying the liver. Another amino acid that helps produce glutathione is glycine. And glycine helps improve digestion by promoting bile and stomach acid synthesis, and stimulates collagen production, anti-inflammatory effects, and immune regulation. Now that we know about the health benefits of bone broth, it’s important to start with quality ingredients to minimize the risk of toxins. Bone broth is one of the cheapest health-supportive ways to nourish your body. Most quality bones cost $2 or less per pound. Many local farmers or butchers will offer bones from pasture-raised or 100% grass-fed animals. If using fish bones, those from wild-caught fish are best. If you don’t have a local farmer, you can order quality bones online. Here is one of my favorite providers. You can buy a bunch of bones and freeze them. If you make whole chickens, freeze the carcasses until you have enough to make a batch of bone broth. Be sure to use filtered water and, if using vegetables or herbs, go for local or organic versions. Broth includes simmering meat and bones (e.g. whole chicken) for a short amount of time (up to two hours). The product is a thin liquid with a delicate flavor. Vegetables are often added during the last 20 minutes of cooking for extra flavor. Broth is a great base for soups and sauces, and may be used to replace water in cooking (e.g. poaching). Stock is similar to bone broth in that bones are used but may contain minor bits of meat attached to the bones (e.g. what remains after pulling off meat from the bones of a cooked whole chicken). The bones are simmered for about 3-4 hours, providing a source of gelatin in the finished stock. Vegetables are often added during the last 20 minutes of cooking for extra flavor, especially since stock is a flavorful base for soups. The starting bones are similar to those used in stock. However, the cooking time is much longer, usually 24-48 hours depending on the bones used (excluding bones from fish). The resulting bone broth is rich in minerals and gelatin. Most often vegetables are not added during the last 20 minutes of cooking, but this is a personal preference and varies with how the bone broth will be used (e.g. sipping, soups, sauces). Bone broth is incredibly simple to make. Although the traditional cooking method takes a long time, it is nearly all inactive cooking time. Any type of bones may be used—chicken, turkey, duck, beef, bison, lamb, veal, etc. Just make sure you use a variety of bones such as marrow, oxtail, knuckles, and feet so that you maximize the nutritional and congealing properties. Feel free to use bones from different animals, but do be mindful of flavor profiles (for example, I recommend keeping fish bones separate). And if you’re new to bone broth, I suggest starting with chicken bones for a mild flavor. Roasting your bones is completely optional—your bone broth will still turn out delicious and health-supportive if you choose not to roast the bones. However, doing so will enhance the flavor, and add a bit of depth and extra yumminess, especially if using beef bones. If you choose to roast your bones, place them in a roasting pan and roast at 350°F for one hour. Or, if you’re short on time, roast them at 400°F for half an hour. Using bones from a bone-in piece of meat that was already roasted? If so, skip this step. Whether you decide to add salt during the cooking process or leave it out is up to you and will be guided by how you intend to use your bone broth. I prefer to add salt during cooking when preparing bone broth for sipping. However, if you plan on using the bone broth in recipes (e.g. sauces) that already call for added salt, you may wish to refrain from adding salt when making bone broth. This will enable you to adjust the seasoning to your preference and recipe. Generally speaking, it is best to cook fish bones up to one hour to prevent the broth from becoming bitter, chicken bones 24-36 hours, and beef, pork, and lamb bones 24-48 hours. These timeframes will minimize bitterness and optimize gelatin and mineral contents, as larger bones take longer to cook. If you wish to add herbs to your bone broth for extra flavor, add a bouquet garni during the last 20 minutes of cooking. Adding the fresh herbs at the end of cooking will prevent them from becoming bitter. Simply tie together a bunch of flat-leaf parsley and 6 sprigs of thyme with kitchen twine. Place the bouquet garni into the broth and then remove at the end of cooking. I prefer to use dried bay leaves rather than fresh ones when making bone broth, which is why I do not include bay leaves in my bouquet garni. This nutrient-dense bone broth is an infusion of simplicity and deliciousness. Sip on this bone broth or use in place of stock, broth or water called for in your recipes. Whether you’re looking to achieve improved skin tone, strong nails and hair, healthy joints, or optimized metabolism, or to help heal autoimmunity, leaky gut, arthritis, gastrointestinal disturbances, or colds, bone broth can help. Place bones in a roasting pan and roast at 350°F for one hour. If you’re short on time, roast them at 400°F for half an hour. *If using bones that were previously roasted, skip this step. Roasting bones is optional, but improves the flavor and depth of the broth. 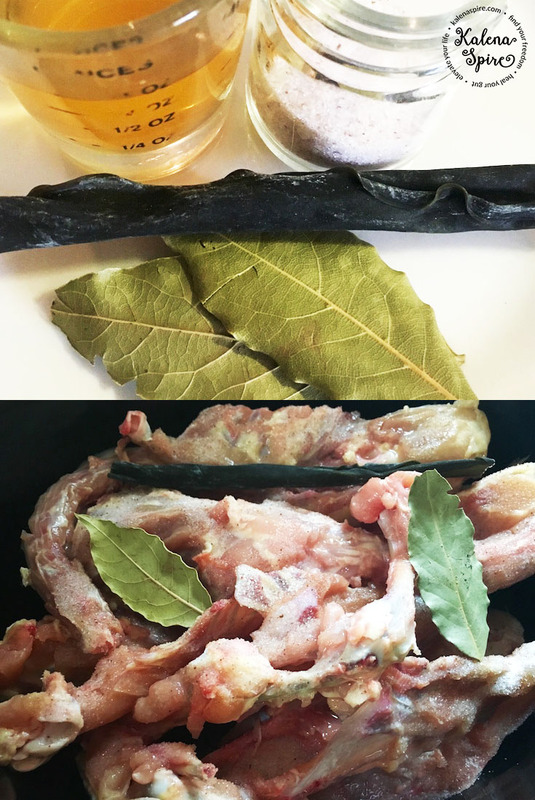 Add bones, water, vinegar, salt, bay leaves, and kombu to a 6-quart slow cooker. Cover and cook on high until it starts to boil. Remove any scum (it's bitter and more will be produced when using pork or beef bones) from the top with a skimmer. Then, reduce heat to low and cook (see the notes below for cooking times for different bones). Add bouquet garni and/or optional add-ins 20 minutes before bone broth is finished. Turn off the slow cooker and allow the bone broth to cool. Strain through a fine mesh metal strainer or colander lined with cheesecloth into a large pot. Cover the pot and refrigerate overnight. Using a fine mesh strainer or spoon, skim or lift and discard the solidified fat from the top layer. Store the bone broth covered in the refrigerator for 3-4 days. If freezing, use a ladle or funnel to pour it into glass storage containers or Mason Jars. Be sure not to fill the jars completely so that there is room for expansion. Alternatively, you can freeze bone broth in a silicone mold such as this one and then transfer the frozen blocks to a glass storage container or Ziploc bag. Use the highest quality bones possible: those from pasture-raised or 100% grass-fed animals, or wild-caught fish. The longer the bone broth cooks, the more nutrients will be extracted from the bones, and the richer the flavor will be. *Bones should crumble upon gentle pressure when done. To make a bouquet garni, simply tie together a bunch of organic flat-leaf parsley and 6 sprigs of thyme with kitchen twine. If you don’t have a slow cooker, place all ingredients in an 8-quart stockpot and bring to a boil. Then, reduce heat to low or medium-low heat and simmer for appropriate cooking time according to the bones used. If using an Instant Pot or pressure cooker, the bone broth will generally be done in 2 hours, but adjust cooking time to the manufacturer's instructions. Make sure to let bone broth thoroughly cool before placing in the refrigerator or freezer. The small amount of vinegar used helps extract the collagen and minerals from the bones without imparting a vinegary taste. Kombu is a sea vegetable and adds even more nutrient-rich minerals. _____________________________________________________________________________________________ Copyright: Christine Cherpak - KalenaSpire. If you wish to share this recipe, please provide a link back to the recipe on the KalenaSpire blog. If you make significant changes to the recipe, please rewrite the recipe in your own unique words and provide a link back to the original post for credit. Thank you! Copyright: Christine Cherpak - KalenaSpire. If your broth doesn’t gel, it’s still good and contains nutrients. Bone broth will keep for 3-4 days when sealed in a storage container in the refrigerator. To extend the freshness, simply bring the broth to a boil on the stovetop to kill off any potential bacteria. Enjoy right away or cool before storing in the refrigerator. For longer storage, freezing works well. 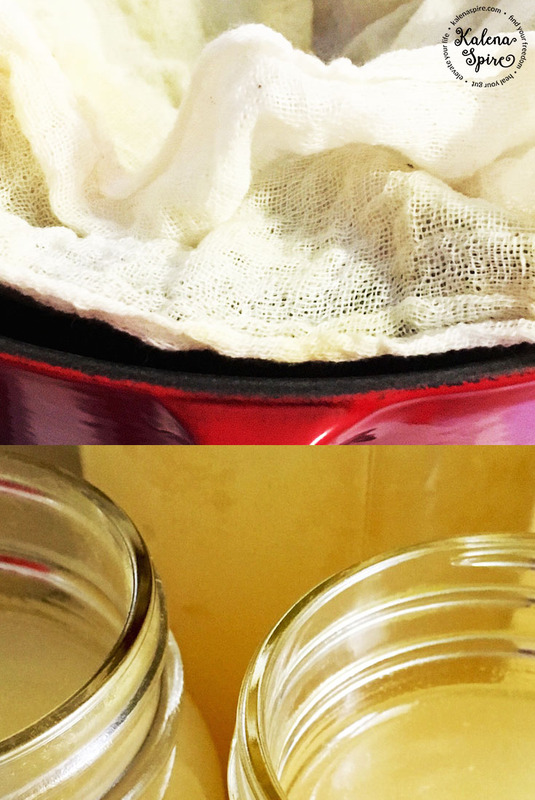 Simply pour (a funnel helps) cooled bone broth into glass storage containers or Mason Jars. Be sure not to fill the jars completely so that there is room for expansion. Once frozen, cover the jars tightly. Alternatively, you can freeze bone broth in a silicone mold such as this one (holds ½ cup when filled) and then transfer the frozen blocks to a glass storage container or Ziploc bag. Make sure you know the volume of liquid each mold holds so that you can easily use the blocks of bone broth in recipes. I recommend making a large batch of bone broth and freezing it to always have on hand. Want the Health Benefits without Cooking? If you like the idea of consuming bone broth, but don’t want to make it, you can purchase quality ready-made bone broth online. This is one of my favorite purveyors. 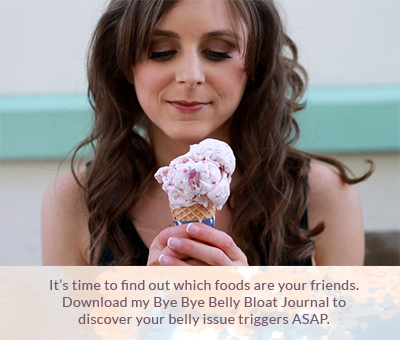 Others are listed in my Bye Bye Belly Bloat Shopping Guide. If you wish to forego the broth all together but still want to benefit from some of the nutrients it contains, supplemental collagen peptides and beef gelatin are great options. Collagen peptides—100% bovine or marine collagen varieties—will dissolve in both cold and hot liquids without thickening them, so it’s a great way to add nutrients to your smoothies, tea, soups, etc. On the other hand, beef gelatin will thicken in cold liquids and is useful for making healthy jello, gelatin gummies, and custards, or adding to hot beverages or soup. While there is limited research specific to bone broth, the extensive research on the nutrients contained in bone broth and anecdotal and theoretical accounts from bone broth users are compelling. Bone broth is not intended to substitute a healing protocol, but rather is a useful adjunct. Give it a try for a while and see how your body responds. Either way, there’s no denying that grandma’s chicken soup made with bone broth can nurse a cold. And for my vegan friends out there, you might like to try this mineral-rich broth or this vegan bone broth. One lucky winner will receive a 10 ounce container of Vital Proteins Grass-Fed Collagen Peptides. *Contest closes at 12 am August 31st. This contest is now closed. Thanks to all who participated! Have you tried bone broth? Share in the comments below! The giveaway was generously sponsored by Vital Proteins. All opinions and thoughts in this post were not influenced by Vital Proteins. This website does not accept paid reviews. This product promotion is based on our own personal opinions and recommendations without bias. Labensky, S. R., Hause, A. M., & Martel, P. A. (2015). On cooking: A textbook of culinary fundamentals (5th ed. updated). New York: Pearson. Mullin, G. E., & Swift, K. M. (2011). The inside tract: Your good gut guide to great digestive health. New York: Rodale Books. I make bone broth every week. I try to make is as gelatinous as possible. My dogs get some with each meal and I use it in cooking as much as possible. I use the Vital Proteins collagen as well as the gelatin in my morning smoothies too! It’s awesome that you make bone broth each week! It has become part of my weekly routine, too. The gelatinous quality will vary with each batch . . . regardless, it’s still delicious and nutritious :). I love that you give some bone broth to your dogs, too. You sure sound like you’re rockin’ the collagen and gelatin boosters in your morning smoothies; way to go! I would love to try using Vital Proteins collagen peptides in my smoothies. I just made bone broth for the first time using this recipe and I love it. It’s really soothing on my stomach. I plan on freezing some in case someone in my family (or me) starts feeling under the weather. Thank you! Awesome! I’m happy to hear that you made bone broth for the first time and liked it. Freezing some for those unfortunate times when you’re not feeling well is a wonderful idea. I never regret having homemade chicken bone broth ready when a cold or stomach bug strikes. Including the collagen peptides in your smoothie is a great way to add nutrients and will not alter the flavor profile. I have gelatin by Vital Proteins in my cupboard and would use the Collagen Peptides in much the same way, ie; soups, smoothies, sauces… and, I am very interested in the differences between the two as I haven’t used the Collagen Peptides before!! Kudos to you for using the grass-fed gelatin by Vital Proteins. I love that product, too. What’s nice about the collagen peptides is that you can easily add it to cold items without the congealing properties of gelatin. Good luck with the giveaway :). I plan to use the product in smoothies and even try it in my coffee. Excellent, collagen peptides in beverages such as smoothies and coffee is a great way to incorporate its health-supportive qualities in your daily routine. You can really get creative and include collagen peptides in sauces, salad dressings, etc. I’ve been making my own bone broth for years now but I didn’t know all of the amazing benefits other than the fact I know exactly what’s in it (and exactly what’s not)! Homemade broth always tastes better than store bought. Thanks for sharing all this information. Woo-hoo, I love that you’ve been making your own bone broth for years! Knowing exactly what’s in it is a big win to avoid potentially harmful ingredients. 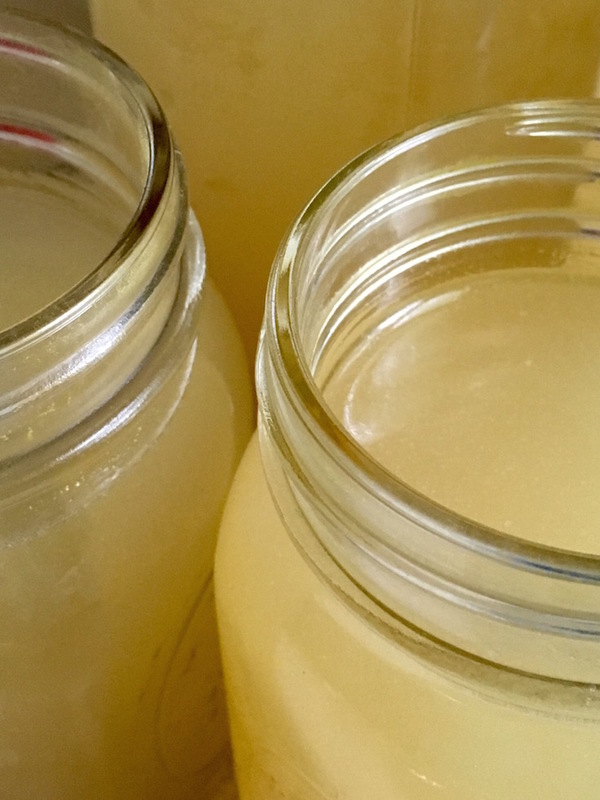 And I agree, homemade bone broth tastes so much better than most store-bought varieties. I’m glad I was able to help educate you about all of the nutrients you consume each time you enjoy your homemade bone broth. I would use it in smoothies! Sounds like it would have been a lovely end addition to today’s navy bean stew. Nice to be able to mix right into hot liquids! Thanks for sharing your idea to include collagen peptides in your navy bean stew. Perhaps you’ll try it next time. Yes, collagen peptides are quite versatile for added nutrition to your favorite recipes! I would use it in my morning smoothie. Excellent idea! I love how easy it is to give smoothies a nutrition boost with collagen peptides. The easily assimilated amino acids in collagen peptides are excellent for the morning, too. I love bone broth, especially chicken. I would use the peptides in an egg smoothie. Yum! I agree, chicken bone broth is my favorite! I love your idea for adding collagen peptides to an egg smoothie. Excellent and beautifully illustrated blog. Thank you! I’m so glad you enjoy my blog. Thank you for taking the time to express your appreciation. I plan on putting in my tea,smoothies, soups,and anything i can find to use it in!! So many of us don’t realize how important collagen is to our health! And once you use it you see major differences in hair, nails, aches,pains,etc. Thanks for your great ideas! I’m glad you have benefited from using collagen . . . I, too, have experienced the wonderful effects you mentioned. I look forward to making this Bone Broth also!! I’ve heard so much about the health benefits of it! I would use it my smoothies. Adding collagen peptides to smoothies is a delicious booster! I love how collagen peptides will not alter the flavor of smoothies, so you can enjoy the nutrient boost with all of your favorite smoothie recipes. You’re very welcome! It’s awesome that you’ve been making bone broth for about 6 years now. I love your suggestion to brush beef bones with tomato paste for added flavor when roasting the bones. Your tip sounds delicious . . . thanks for sharing! I love your idea to use collagen peptides in nut butters! Keep your imagination going :). Vital proteins is THE best! I use it daily to help keep my gut strong and happy. Woo-hoo, I’m happy to hear that you have had a positive experience using products from Vital Proteins. The company offers excellent products for gut health. I would use it in my daily smoothie. This is a tried-and-true use of collagen peptides. Now you can let your imagination run wild with different smoothie flavors :).